I remember scouring social media those first few days of Cash's life. We were at Arkansas Children's in Little Rock within a day after his birth. Nights were filled with thoughts of how this new life would be and the uncertainty and fear that follows. So, there I would sit-searching, googling, searching again. I would scour social media looking for families like ours, looking for pictures of happy families to remind my fearful heart that we would one day be that happy family too. I was also searching for something else, though. 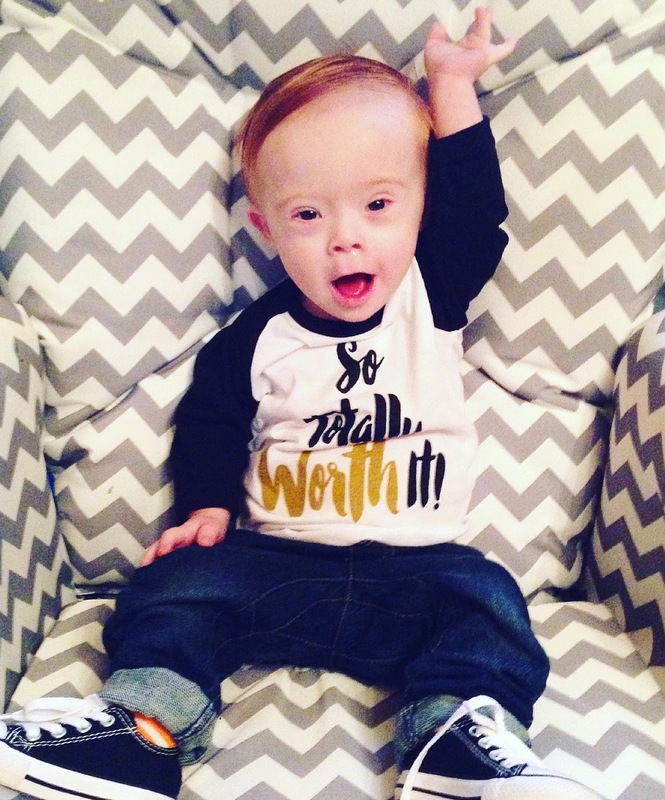 For little babies after Down Syndrome. The truth is that I was so ashamed. Here I was, with a beautiful, fuzzy-headed red headed little boy, and yet I was already wondering about another to come. Would they have Down Syndrome too? Was the hope of a third child gone now? The geneticist had informed us that all future pregnancies up until my mid- to late- thirties would have a 1 in 100 chance of another Down Syndrome diagnosis purely based on statistics. I messaged another mom who I had recently connected with on facebook. With complete vulnerability, I found the courage to ask her how they had decided to have another child after their son's diagnosis. I felt silly but it was so heavy on my heart. I remember her telling me in so many words, that after some time, it didn't matter to them if their new little one had Down Syndrome. At this point in my journey, I couldn't fathom that freedom. That peace with the diagnosis. Fast forward three years. As Cash has grown and thrived, I've often gone back to these moments. 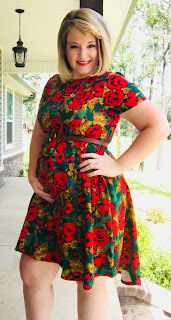 Would we have another child? Yes, someday. Was there still fear and uncertainty? Absolutely. But, I also began to understand her initial peace with the diagnosis. Down Syndrome wasn't scary to me any more like it was in those first days and months. Instead, it had brought so much joy and growth to our lives that I didn't want to live in a world without it. Down Syndrome was a blessing. Soon after Cash turned three years old, we got an unexpected surprise in the form of a positive pregnancy test. Timing was not great. I was switching jobs and we had hoped to wait another year before trying. But, of course, God has to laugh at our plans sometimes and throw us a curve ball. Days after finding out about our new little one, those fears creeped back in during the quiet of the night. And there I was again, back to square one--googling and searching for the information I already knew trying to find some peace of mind. I felt overwhelmed by that old friend named fear that I knew well from long ago but have learned so well to push away. But, there it was again like it had never left. Fear is binding. It's like a straight jacket for your soul making it hard to breathe let alone live a full life. I prayed that the Lord would give me faith. That I would learn to trust Him even when I felt afraid. 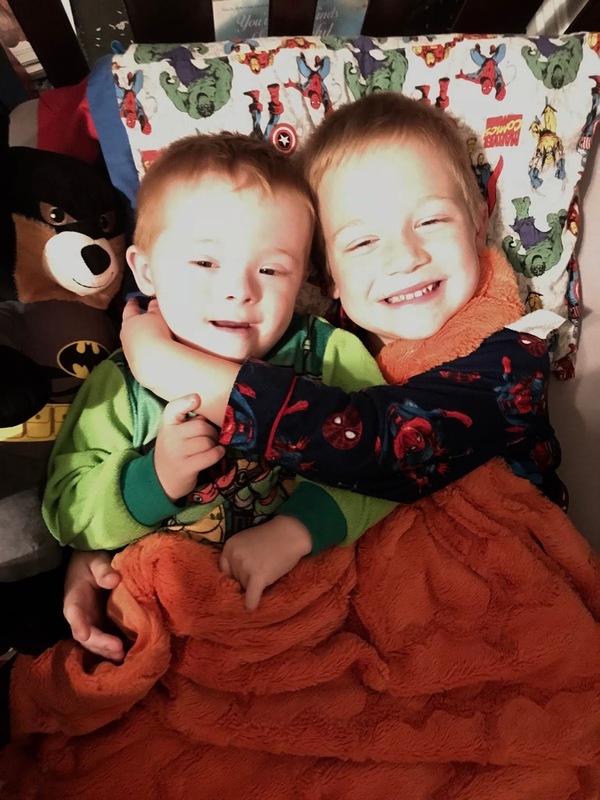 As I was sitting on the couch with my boys one night, Cash and Parker snuggled close to me and Warren, I looked at my little boy and felt God stir my heart. I was so overcome with a love for this little boy who I had feared so much in the beginning that I felt like I literally might burst. And with that love, He reminded me that it didn't matter. That He knew long before we did all the perfect joy Cash would bring to our family. 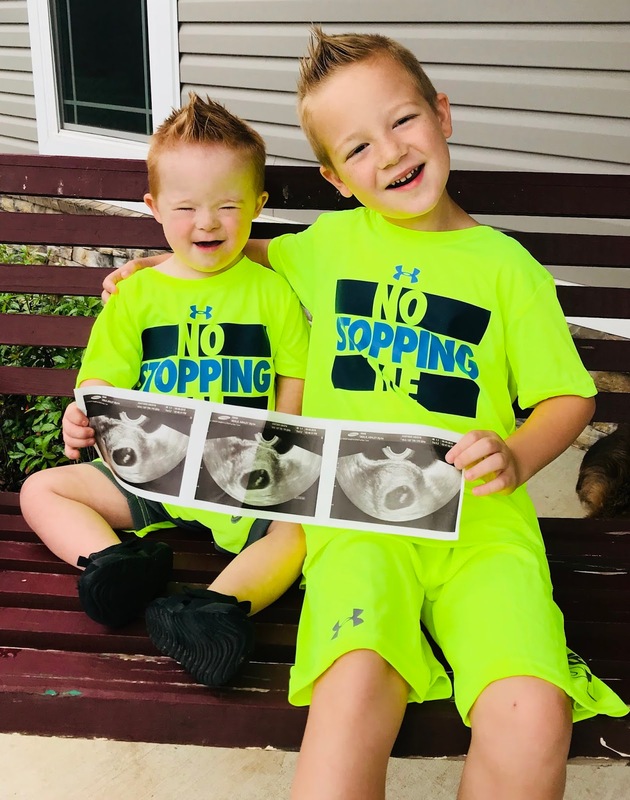 In the same way, He's known all along all the ways this new little one will overflow our hearts, as well--extra chromosome or not. And with those words, God healed my fear and reminded me that He loves me. That His intentions are pure and good. And that no matter what, we'd never be alone. 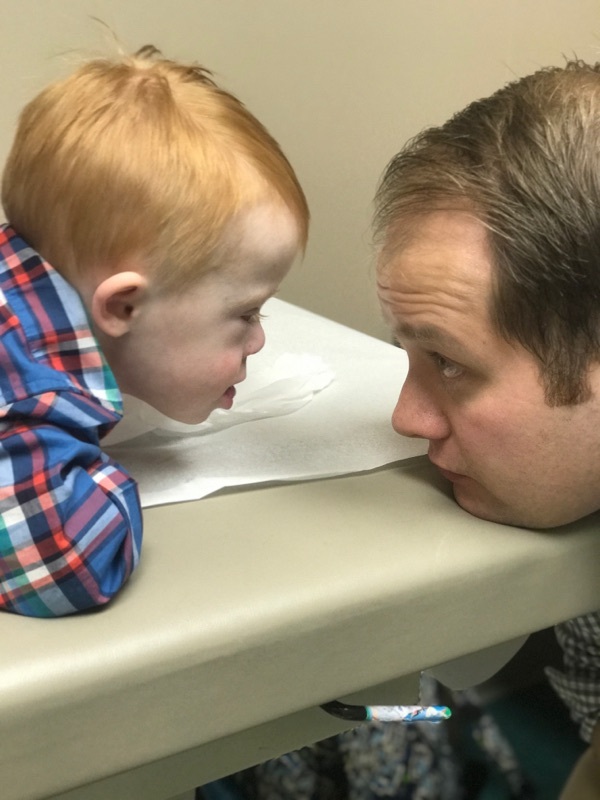 In less than a week, we will have a very non-invasive genetic test to determine whether or not our growing little one has any more common genetic abnormalities, primarily Down Syndrome. I could have easily waited another week to write this and told you "see, God is good!" Instead, I've always wanted you to see this journey for what it is. Fears, joys, unknowns. No matter what we find, we will love and cherish this little soul. It will feel more love and sloppy little boy kisses than any baby has ever known. It will be taught that Jesus died so we could live. That kindness is not always easy but the world needs more. Because the truth is, this journey has become less about Down Syndrome and more about living a life without the shadow of fear. One of hope and joy. A life of raw, honest faith that takes twist and turns along the way. My deepest prayer for you is that you would feel that freedom. The freedom that comes when you learn that His love for you is deep. A love that cast out all fear. And though life is ugly and scary and sometimes it really feels and looks like He is nowhere near good. I pray you'll cling to the light and push through that fear. You are so far from alone. Just the other day, I heard this new song from Francesca Battistelli. It reminded me so much of my own daily struggle with fear. so fear, you will never be welcome here"
As I lay restless tonight, my mind replays my encounter with you today. I know you didn't mean to make us feel exposed and vulnerable but sometimes these things just happen. I've seen your eyes before. Though it's been a while since I've noticed them, I've seen them grocery shopping, at playgrounds, and in conversations when I talk about my son. Those eyes of pity. Those eyes that make my heart beat and my face burn. Those eyes that sometimes bring anger and other times, sadness. The ones that keep me up at night like they are tonight. We saw you and your family at the shoe store. I was pushing my two boys in a stroller. 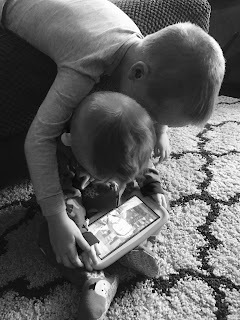 My oldest watching a cartoon on my phone and my youngest sitting quietly at the front. As we strolled aimlessly down the aisle, I saw you see Cash but didn't think much of it. As I came to the end of the aisle and turned to go back the other way, something you said and your sad eyes caught my attention. I watched as you whispered to your daughter, "He's down's, isn't he?" It wasn't the "Down's" part that bothered me though the sarcastic part of me wanted to say "Hello, Captain Obvious." It was the sadness I saw in you. The way your tone and expression made me feel exposed and self-conscious. That you felt sorry for us because my sweet little red head has Down syndrome. As I watched you, I felt those familiar hot tears reach out and begin to choke me. The ones that make me want to hide before any sees the dam break and the emotions come. As I continued down the rest of the aisle, my mind was telling me to leave the store. To call it a day and hide away so nothing else can prick those old scars. But, instead, I felt this urging in my spirit to stay. I felt brave. I turned down the same aisle and walked by you again as you stared. Though I didn't say a word, I wanted you to see him again. I wanted you to see his brown eyes and how they shine like glass because of brushfield spots. I wanted you to see the way his almond eyes allow his whole face to smile when he's happy and how that flat area at the top of his nose makes his nose crinkle sometimes. All these things that are, in fact, caused by the "Down's" are actually my favorite things about him. You see, I've been you before, too. I've given those sad eyes to others who's differences are flaunted for all the world to see. I've felt those sad eyes for myself on the day that Cash totally rocked our world. But, now, as I sit on the other end of those sad eyes, I feel the burn they bring. Instead of those sad eyes, I wish you would have said hello to him. Yes, he knows what that means. He probably would have blown you a kiss. Instead of those eyes, maybe a high five or a smile. He's able to reciprocate those things, too. In my heart, I just kept saying to myself, "if she only knew the joy he's brought to our lives. The ways he's opened my heart and eyes. She'd be jealous." And I hope that, one day, when those little boys start to notice those same sad eyes, they'll walk by with confidence and pride saying, "if you only knew." We really are the "lucky few." Tomorrow is Cash's 2nd birthday. Like I've told many, I feel like I've lived so many lifetimes in such a short time. As we've approached this day, I've felt an array of emotions. I feel happiness as I look back on the tunnel of the last two years and find that it wasn't nearly as dark and overwhelming as I initially thought it would be. I can still remember the way that I cried that first night after his birth. I was terrified of the journey ahead and felt unprepared and just entirely "not enough." I thought life as we know and dreamed was ending. That's probably one of the few things I was right about. Life as we knew it had ended and we were entering into something so much more profound and deeply moving than we could have ever dreamed up ourselves. For those who have followed the last two years of our life, I wouldn't truly capture our story if I didn't write about the hard moments and even days, too. Today, facebook memories brought up a video of Parker from 3 years ago. He was 4 months shy of two and repeating everyone's names as I said them to him relatively clearly. It felt so strange because it is so different from where our Cash is now. Even now, as I write this, my view is clouded with tears as the length of the road weighs heavy. Cash says words and signs even more but we are often reminded of how far we still have to go. I fully thought he would be walking by now. Though we progress towards this milestone every day, the reality is that we could still have many months before he walks independently. 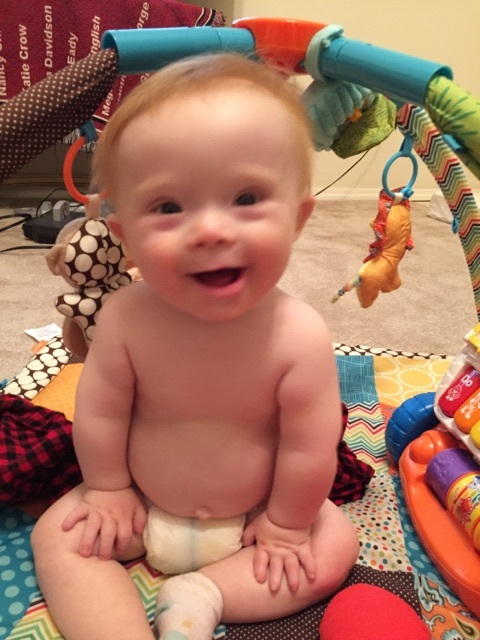 Does Down syndrome make me sad sometimes? Yes. I have spent so many moments and DAYS of the last two years still not feeling like I was enough. I don't spend hours teaching him extra skills after therapy. I only know about as many words as he does in sign language. I don't constantly research new ways to teach him new skills. I usually don't know the latest research and I have trouble remembering when we have appointments. Sometimes I wish I could allow my little boy to be exactly that without feeling guilty. If I could travel back to March 31, 2015 and allow myself a vision of our life now, I know, without a doubt, that April 1st wouldn't have been such a scary day. I would see his smile and the way he giggles in the back of his throat. I would see the way he nudges his head right into the groove of your shoulder to where he feels extra snuggly when you hold him. I would see the way he crawls with lightning speed after his big brother and those eyes that reach into your soul. I would see the way he loves ice cream and macaroni and cheese. 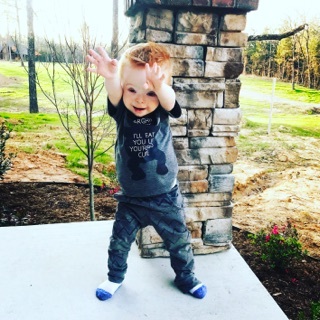 And all those days to come, when milestones feel like mountains and the words of others cut extra deep, would dim in comparison to the ways this little boy would change my heart. Someday, my little boy will read these words. And even amidst the happy and sad tears we've cried in his life, I hope he will see how much he's changed the deepest parts of me. I hope he sees how proud we are of the ways he's overcome odds and defeated expectations. I hope he sees the moments where he made our hearts swell with pride and how we love others better and deeper because of him. And I hope, more than anything, that he sees how we would choose him, exactly as he is, over and over again. I was right two years ago when I didn't feel like I was enough. I'm not. But, now I see that I was never meant to be. And on those days, kind of like today, when I feel sad that I'm not enough, I can hear the Lord whisper "but I am." So we choose joy today, tomorrow, and the next day. Certainly not because it's easy but because we choose to live each day with a changed heart. Happy Birthday, Money. You are truly "so totally worth it." The power of the words of others have been heavy on my heart lately. I've heard phrases such as "mongoloid," "libertards" and more. Some days they flow in one ear and out the other. Other days they sting like a fresh wound. Reminding me how far we still have to go. As a result, the Lord's been reminding me about His heart for us. Who does He say that we are? Having a sensitivity to to the power of words has caused me to want to speak words of power over my boys. I want them to be so finely aware of their identity that the words others speak against them as they grow bears little weight on their understanding of who they are. On the way to school the other day, I began to tell Parker all the things I loved about him. I said, "Parky, did you know that you are smart?" He told me that he knew he was smart. I said "Did you know you are kind?" He said yes and I went on to ask him what it means to be kind. I wanted to see if he understood the words I was using to describe him. I told him a few more things and then said "what else are you?" He said "I'm brave." I asked him what it meant to be brave. He said it was when you do something even when you feel scared. We went on to mention several things that we thought Cash was, too. Brave, smart. Up until this point, we haven't really pointed out to Parker that Cash is considered "different." To him, he's just his little brother who follows him around and plays with his toys. He doesn't notice his almond shapes eyes or his low muscle tone. He just sees a person. knew what it meant to have Down syndrome. He said no so I told him that sometimes people with Down syndrome might look different in their eyes. Especially grown ups with Down syndrome. I said, "did you know that some people may say that Bubba isn't smart because he looks different and has Down syndrome?" He audibly gasped. He couldn't believe that. He said, offended, "Well my bubba is smart." I said , "I know but sometimes people don't understand when people look different and it makes them think those people aren't smart." He responded, "Well, I have Down syndrome, too. I look different from everybody else and I'm smart!" Tears filled my eyes. Though he may not have meant the statement to be as profound as I took it, the Lord took that moment to speak directly to my heart. "It's that simple, Brooke. 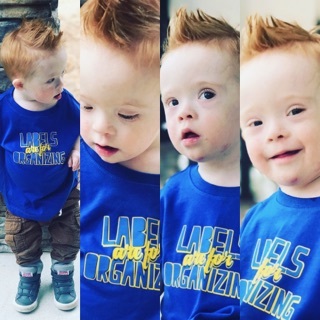 We are all Down syndrome." You. Me. The woman checking you out at the store. The man holding the sign at the corner. We are all different. Unique. And equally loved by our creator. It's funny how much my little humans teach me about loving people. How much they humble and surprise me. Their faith is simple and easy. They don't judge by the standards of the world but instead on what they see and feel from your heart. Sometimes I ask Parker who made him so smart. Very simply, he always states, "Jesus did." It is so easy for me to forget that God loves that person that my pride avoids just as much as He loves me. It's a humbling thought to realize the depth of my sin and self righteousness and remember how much God's grace has rescued me from. 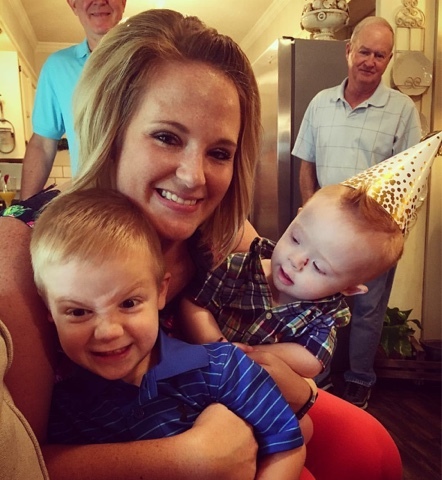 For so long, especially after Cash's initial diagnosis, I believed the Lord owed me for being faithful to Him. For being a good person. Admitting some of what I consider to be my most shameful flaws is scary and embarrassing. But seeing how broken I was. How angry I was because I felt so "entitled" from God began to stir in me a new awareness for His grace. Seeing how shameful the darkest parts of me are made me acutely aware of how much I needed His grace. Not how much I deserved it. He has called us to have that same grace for one another. But how complicated we make it. Female. Male. Black. White. Liberal. Conservative. This. That. It takes the simple words of my little boy to remind me how effortless the truth can really be. We are all Down syndrome. Different. Beautifully unique. Equally loved. Equally broken. This is probably one of the first posts that I'm really nervous to write. Scared of how others will take what I am about to say. Though the other posts I write are just as honest and raw as this one will be, I wrote them from a place of complete acceptance of where the Lord had led me in our journey. I was confident in the lessons I had learned through our experiences and unafraid of criticism that may come from others as a result. But this one. This is one that is still heavy. One where I'm still "not there yet" and, depending on the moment it happens, can speak out of an ugly place. One that I can see the old me in over and over again. One that can bring life and power and open new doors to new perspectives. This one's a little different. I've been thinking of writing about this same thing for quite some time but, as a result of not knowing what to say and how to say it kept me away from this topic. But, of course, as He does, God slapped me in the face with it again today. And now I just can't walk away. I began Saturday with an early morning meeting for a professional certification that I am pursuing. Warren stayed home with the boys and off I went. The meeting ended earlier than I had expected, around 10:30 or so, and I took the opportunity to visit my favorite little ladies at the nail place I go to. One of my guilty pleasures. I rarely get to go since I almost always am on my way somewhere or have babies with me so I was excited for the opportunity to have a little bit of "Me time." As I walked in, I noticed there were several others ahead of me so I sat down in the chairs to the side and waited. One of the ladies there is one I work an ACT tutoring program with so we immediately began to talk. I mentioned to her that I wouldn't be able to attend an upcoming ACT workshop due to the fact that I had to take Cash to Children's the same day for a check-up. She knows a lot about Cash's story so I just stated in passing "Cash just has an appointment to get his blood checked. You know, since he's at a higher risk for leukemia." Another lady sitting to the side, one that I had never met, heard my comment and immediately expressed concern. Surprised by the word leukemia, she said "Has your son had leukemia before?" 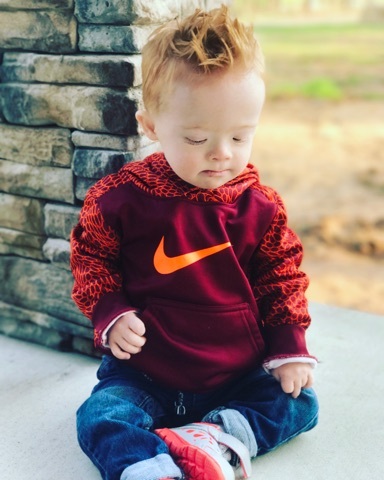 Since it's often complicated to explain Cash's story in a public scene, I first said "Well, he has Down syndrome but also had a rare condition when he was born called Transient Leukemia, that puts him at an even higher risk for childhood leukemia." When I first mentioned that Cash did, in fact, have Down Syndrome, she immediately began the "ohhhh, I'm sor...." that I often get when telling people about his diagnosis. 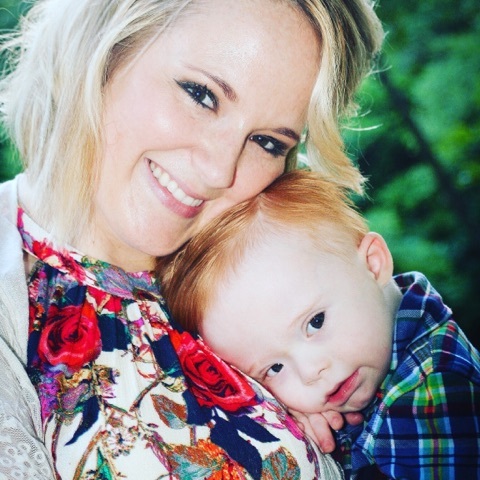 I cut her off before she could completely finish by expressing that it was totally okay that he had Down syndrome. She immediately took interest to his diagnosis and began on the topic of children with special needs. Now, let me preface with this. As we talked, I immediately noticed that she came from a genuinely caring place. So, though many of the words she spoke would have normally hurt my heart, I reminded myself of where I could see her heart was coming from. She noted on the "happy" stereotype that we usually get. How people with DS are just "so happy all the time." You know, they live in a blissful state of fairies and rainbows and never feel actual pain or disappointment. (Those are my words, not hers.) I saw this as an opportunity to explain that, although Cash is overall very loving and happy, he also has a feisty side. A few other ladies and I laughed that his feisty spirit probably stemmed from his fiery red hair. The lady continued to discuss the topic of special needs. She commented on how she was so happy that now "people like my son" can have jobs. You know-jobs as cart pushers, grocery baggers, or some menial task to give them purpose and identity and the opportunity to contribute to society. These words stung my heart. Though these are perfectly fine options for so many individuals, much of my goal on allowing the world to see our life with Cash is for them to see his potential. For the army that lies in our community to not see Down syndrome first but to see Cash as Cash and dream BIG alongside us. Dreams for a life, jobs, education, marriage, etc. that is anything he chooses to make of it. Again, knowing she truly meant well, I just commented that we believe that Cash will be able to go to college and accomplish much more, especially with the incredible opportunities available in our world now. She agreed and continued on the topic. The next thing she said is the exact topic I've bring trying to avoid. She said "you know, I don't even really consider disabilities like Down syndrome and Autism to be in the "retarded" category as much anymore." She had dropped the r-bomb several times in our conversation moments before but this is the first time I felt like I really had the opportunity to address it. This is the moment I've dreaded since Cash has been born. 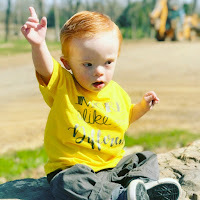 The moment when someone at school calls him the r-word and I have to explain its meaning to a child that understands he's different for the first time. The first time we would pass an adult while he happily plays in his stroller and hear them describe him using this word. The moment when someone associates his genetic condition with a word that speaks death, limitations, and negativity. I knew it was coming but I don't think my heart could ever have been ready. The milliseconds that passed between her words and my response felt like minutes in my mind. I was searching on how to explain how that word made me feel to a stranger. How to not come off as if I was angry or hurt but instead approach it with love so that maybe this lady could walk away with a new perspective. I was searching for something so profound that it would blow the roof off that nail place and allow everyone sitting there to walk away with a new understanding. But, you see, I didn't have it. I couldn't find those earth-shattering words that are so captivating that you walk away patting yourself on the back on how awesome you are. So, to mask my hurting heart, I simply and calmly stated "You know, many try to stay away from using that word anymore because of it's negative connotation." I spoke of a few alternative catch phrases that are often used to describe individuals with special needs and we went on. I didn't speak much after that. I was probably too busy licking my inner wounds and trying to recover from the situation I had been dreading all of Cash's short life. The last thing I said was, "we are so much luckier to have him than he is to have us." You know, if this would have happened six months or longer ago, when my Aunt had passed away and I was just really dealing with Cash's diagnosis and my often intense anger at the Lord, I would have responded from a very painful place. I was running low on grace for others because I was wallowing in pity for myself. I was selfish. Broken. And so, so angry inside. Before Cash, I had used that word before too. I've always been very sensitive to how my words made others feel so of course I never used it to describe anyone. I would often use it interchangeably with the word "ridiculous" when I thought someone was being silly or crazy. I had no idea of the power of this word. I've been there. I can understand how, if we just don't know, we can't make a change. I know some of you reading this are thinking how sensitive we are in today's world. How "we can't take offense to every single word" and blah, blah, blah. I've seen your comments on social media and how the world just needs to "toughen up." Your argument may be true in some circumstances. But, if toughening up means that we just say what we want because we live in "'Merica" and we have the "right" than I certainly don't want to live in your America. What if the trouble with society is not that we aren't "tough enough" but, instead, we lack grace and love for other human beings simply because they differ from us. We spew division, hate, and close-mindedness with our words without thinking of the person first. Proverbs 12:18 says that "the tongue of the wise brings healing." Healing, y'all. What we speak and how we speak it can bring HEALING to a broken soul. Who would seriously not choose the opportunity to help heal another? Our words have the power to bring hope to those who have no hope. Allow those who feel alone and weary to feel loved and renewed. That's our power and the power God has allowed us. Those of us who get the incredible privilege to be Mommies and Daddies have an even bigger opportunity to teach our children about the power of their words. Because if it doesn't begin with us now, our children will live in a loveless, Godless word full of people who feel it's their God-forsaken right to say what they want when they want. 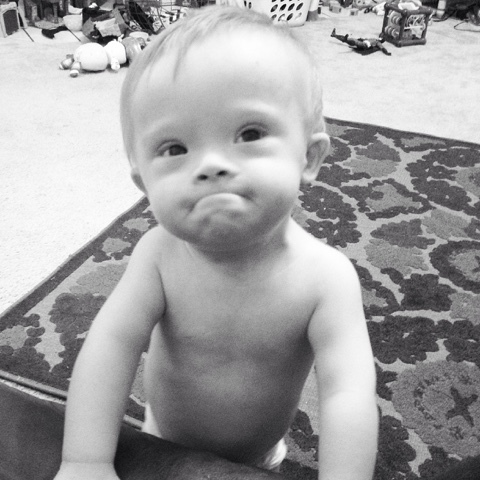 As we come to the end of October and Down Syndrome Awareness month, I hope you'll remember the power God has given you. The power to speak healing, hope, and joy. The opportunity to breath life into the hearts of those around you. There are moments in your life where God calls you out to something so much bigger than yourself. Something that requires you to transform your heart to be so much more like His but terrifies, stretches, and even overwhelms you. Marriage, motherhood, tragedy, profound change. Some of these moments are so wonderful that you immediately recognize the beauty and joy that come from it. Others first come as something you never asked for, may not "deserve" (since I often feel so entitled to God's blessings to me), or even just truly don't want. As time passes, your heart changes, and God heals, you immediately begin to see the flecks of beauty. You begin to feel the ways He's called you to a world that is so much bigger and more beautiful than you ever knew. One that allows you to love with bigger love, dream bigger dreams, and see with clearer eyes. I remember first seeing Parker and thinking that I was born to be his mom. His little life began to pull me out of my selfishness and teach how to love a little life that I truly felt I didn't deserve. Marriage has taught me how to love better. How to understand the emotions and thoughts of another even when I don't want to. How to fight for God's desires of faithfulness, commitment, and plan even when you're tired and just kinda wanna give up. All of these moments I immediately recognized as beautiful, happy, "big" life moments. I immediately knew they changed me right when they happened. But then, almost exactly a year and a half ago to the minute that I'm writing this, a little boy with almond eyes, curved pinkies, and an extra chromosome completely rocked my world. And, in all rareness, at first I was devastated. Oh, how I loved him but he came with so much more than I expected. I didn't understand his differences and the fear of the present and future shook my life in a big way. As I look back on this day, the rawness of that day is still strong. When compared to all the days of my life full of color, this days feels like it was put under a different filter. Like the photo of this day looks better with black and white. Simple yet so commanding. And maybe there's a reason for that. God used that day to cleanse me. To call me out of a place of comfortability and "Leave It to Beaver" Christianity and into a new desire. As I've lived in this world for a year and a half, I feel like I've lived so much more life than I did in the 26 years before. I've had to determine the life I want to live and the woman I want to be. The type of mother I hope to become who's children are kind, thoughtful, and mighty. The kind of wife I need to be that supports, loves, and encourages her husband even when our relationship and I feel weak and weary. I've been blindsided by the loss of a beautiful friend. My family has been raggled by the loss of my beautiful Aunt who we yearn for daily. God has used Cash and his 47 chromosomes to call me out. At first it didn't feel "fair." I didn't feel strong enough and I didn't understand how that little soul would challenge me in ways I never knew. But this world, y'all. This new world is brighter, full of more color than all those days before. It still has it's fair share of heartbreak and sadness. But, it contrast so beautifully with that first day in black in white. We love better and deeper. We set and push for big dreams. We understand the beauty of different and how we all are really just the same inside. Today begins what I'm sure you'll see on social media, the first day of a month devoted to bringing awareness to the unique characteristics that come with Down syndrome. 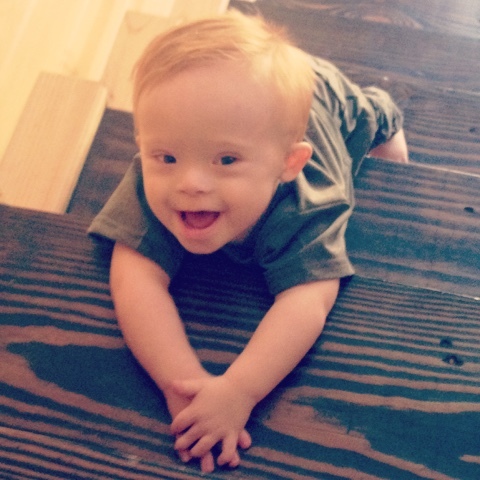 I hope you'll not only learn and understand more about Down syndrome but that you'll also learn more about yourself. That you'll join us in new world that still has sorrow, sin, and loss. But also a world that allows you to love yourself, your family, your friends, and even strangers in a way that Jesus does. My Parker said something profound the other day. He always talks about his Daddy "fighting bad guys." He was talking about those bad guys in the car on our way home from school and how he was going to fight them in typical 4 year old fashion. I said "Parky, did you know that God loves those bad guys even though they make bad choices." "He made them just like he made you and me." He thought for a second, and so matter-of-factly said "Well then we have to love them, too." I hope it's always that simple to him. That we just love others purely because Jesus does. That's our new world. 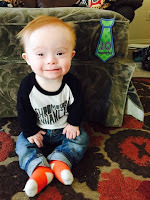 Happy October and Happy Down syndrome awareness month! I hope you'll walk with me on this journey. If you haven't noticed already, there's been a change in the name of my blog and Instagram. There's a story and deep meaning behind this change. Since Cash has been born, I have had more experiences that have been completely God-ordained than I did in my whole life before. Deep conversations with the Wal-Mart cashier listening to the story of her life. A Wal-Green's associate with tears in her eyes as she looked at my boy and remembered someone she had loved like him. Soul moving connections with mom's who feel the ache and joy for their child that I feel. Through Cash, the Lord has opened my eyes and heart to the stories of others to remind me frequently that He has purpose for my child. For our family and this journey we have began. It's like I was blinded before. So consumed in myself that I didn't notice the heartache of others, much less feel it. I didn't see or appreciate the battles that they had fought and won and lacked the sensitivity to truly be interested in their journey. We began building our first home in June. In early August, before school began, we knew we needed to go ahead and choose the type of rock and brick we were going to use. Warren couldn't come so Mom decided to come with me during her lunch hour. Before we went, I called the man who owned the business we were going to purchase from to tell him we would be coming by. He told me that he wouldn't be there but that his wife, Emma, would and she was much better than him in helping to pick out something that matched the look we were going for. With the kids at school, mom and I went over there, intending for it to be a quick trip so she could get back to work. We went in and asked for Emma. I immediately felt drawn to her due to her sweet smile and warm personality. She helped me pick out our stone and brick and we began to small talk as she processed the order. At some point, I can't remember how or why, I began to mention our journey this past year and told her that my son, Cash, was born with Down syndrome in April of 2015. She paused, looked at me with tears heavy in her eyes and simply said "I have one, too." At first, I didn't understand what she meant. But, as I processed her statement, I realized. She spoke of "her Cody" with such breathtaking love and pride. He is around 30 years old and also has Down syndrome. She mentioned that a year or two ago, she and her husband had planned a trip to Costa Rica. They just didn't feel like they wanted to go without Cody so they decided to take him along. As they checked into their hotel after arriving, Cody not far behind, the receptionist said "I have a blue rose, too." Not understanding what she meant, they asked her what she was referring to. The lady explained that, in Costa Rica, blue rose's are considered one of the rarest and most beautiful flowers. Anyone who finds one is considered incredibly special. She said that, when a child is born with Down syndrome, they are called a "Blue Rose" because it is considered so beautiful and rare. As I listened to her story, tears fell down my face. It was the Lord's beautiful way of reminding me that our Cash was just the way He had planned. So beautiful and rare. Highly favored. As we both cried, Emma said that she felt that, someday when we get to heaven, she wonders if maybe we will all be like Cody and Cash. That maybe they are how the Lord meant for us to be all along. Two hours later, we left with our brick ordered and hearts full. I've thought of this encounter countless times since. I actually saw Emma again a week or so ago and my heart jumped as I immediately felt that soul connection again. We talked again and shared tears about the ways our boys have blessed us. You truly never know the purpose you can bring to someone's journey. God used Emma to do that for me. I was reminded again about how blessed we have been by our Blue Rose. I often find myself sad for other people that they don't get to have a Blue Rose. That they don't get to experience the joy that lies in the unexpected. The beauty that comes from what once felt like ashes. The awareness that comes with an experience that challenges you to see the world and people as Jesus does. Since this experience, the Lord has awakened a desire in my heart. I always said that I thought it would be neat to write a book someday about our journey and the way God has used the reality of our sin to draw us near. I never thought it'd be something that I'd actually do but God has began to put this ache in my soul to write and share in hopes of reminding others of the honest life He desires us to live. I don't know how long it will take me or if anyone will read but I'm going to do it. As a result, this blog is going to take on a new life. I hope to post much more consistently as I piece together what the Lord wants me to say. I pray that you will read as I begin this new, scary, and vulnerable project and share with others our story. The story of our Blue Rose.